There's a "new" report out that's making the rounds saying that the sales numbers of hard media like DVDs and Blu-rays are declining while sales of movie tickets and digital media like streaming movies will outshine the plastic disc numbers. The point made in the study is that revenue from streaming content will outshine DVD/BD sales by 2018 at the latest. But if you look around, most anyone might have taken notice of the slow and inevitable trend of streaming movies. In 2009, a seasoned Hollywood expert/insider had made the statement publicly about declining DVD/BD sales and that streaming media would be the way to go, or for consumers to embrace the premise. That insider was Jon Favreau, that paraphrased statement was on one of the extras on his Iron Man DVD/BD. This recent point about streaming sales seems a bit moot.To be honest though, streaming has it's advantages. For one, if you can host your entire library on your PC/laptop/TV screen. Imagine all the space you'd be saving in your home. But the slow transition to a streaming model is understandable. I still enjoy holding my product in my hands and looking at it, up close, in the real world. Though I'm not sure I'm totally in love with having to always turn on and wait for my BD player to get the movie up to speed. And the transition, IMO, is dependent on the actual age of the consumer. Old school consumers seem less likely to embrace or even try to embrace streaming content. I still meet people today (In fact last Friday) who don't even go on or need the internet. I envy them in some ways. And that demographic is fading and being replaced by the younger generation. The younger generation is pretty savvy in the streaming department. As the consumer who grew up with the internet gets older and becomes the buying demographic, I can see how the streaming sales will eclipse disc sales. Even if it doesn't happen by 2018, it will happen some day soon. And the profits will benefit the early adapters. I look at all the space my movies take up on the wall and think it would be nice to not have these things take up all this space. But I have no incentive to replace my movies with digital content because I'm not prone to pay for something I already own. Nor is there any one provider yet that allows you access to ALL your movies. 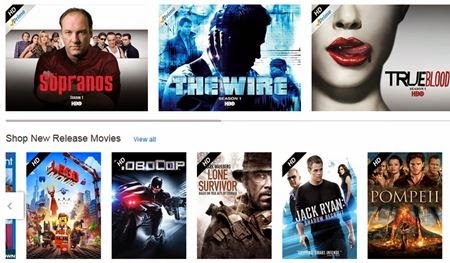 There are different ones, like COMCAST, Flixster, Amazon and other services. Another concern is that I'm always willing to consider buying a digital version of a movie, but it irks me to be paying similar prices for something that no longer needs profit margins added in for materials or shipping and handling. As streaming gets more and more common-place and older consumers buy newer TVs that access the web, and it gets harder to avoid because the industry will sooner or later force the consumer by fazing out the disc player, like they did the VCR, then it's something we'll have. And once the industry does faze out disc players, then what? Will it be all streaming? Will movies sit on USB-like sticks or will we have access to our libraries through a single interface so we don't have to keep screwing around with what movie sits under what provider? I think that's the biggest hurdle. Some single provider needs to step up and be the one entity to access all your digital content. Then the older consumer could be more easily persuaded to come on board the digital/streaming world. Oh, and this crap about movie theater sales improving, yes, that's true. Financially speaking, movies are making larger box office dents and records every day. But that's more from inflation and extremely over-priced special or large formatted movie screenings that take up more than half the screenings of any movie these days. Don't let the numbers fool you. When you look at how many tickets were sold, not how much money was spent, the math works out differently. Dang, that looks comparable, doesn't it? Oh, wait, let's look at how that stacks up when you look at the average ticket price from the two eras. 1987 Robocop: 13.5 million tickets sold. 2014 Robocop: 7.4 million tickets sold. Back on track: I don't mind streaming, plus I don't mind that this is where our future is headed. The convenience of being able to turn on my TV and pull up a movie I own without having to power anything else up, well, is appealing. I still enjoy opening my BD packages, but the days are coming. And I would enjoy it if I had one interface to access all my content, nut several. Are you embracing the digital realm of movie ownership, AKA, streaming HD yet? Or are you enjoying your old school life still? I'm happily in both worlds at the moment, but I'm sure that sooner or later, I'll become a convert. Like much of the consumer market.